The Garden Plot: Oh Christmas Tree...are you for real? Oh Christmas Tree...are you for real? So I am enjoying the typical signs of Christmas everywhere...stores are decorated to the extremes, the 24/7 Christmas music on the radio and the many Christmas tree lots popping up on the side of almost every road. I drive past many of them in my travels and every time I see one I think about my tree...the tree I grew up with. Now don't judge me...yes, my artificial tree. My parents bought it when I was about 5. After they discovered that my brother and I had allergies...severe ones to anything that grew in nature...which meant we would never have a real tree in our home to celebrate the holidays. So they went shopping for the next best thing...a tree that would bring us an allergy-attack free holiday. This is that tree. Yes, I still have it 35 years later. When I was younger I thought all Christmas trees turned. 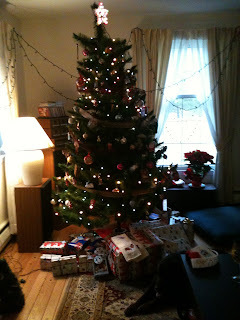 I couldn't understand why my friends didn't decorate the whole tree...the back part facing the wall was always bare. Now I love the fact that I have more room for more ornaments! Lots more keepsakes to accumulate! It is unique to say the least. All my holiday guests are shocked when they see that it turns! It always becomes the most videotaped item at the party...always with the comment "My friends are not going to believe your tree turns!" And then I get the inevitable question "how do the wires from the lights not get tangled?" It's a secret...only Santa knows. Well, the tree has 'lived' to participate in yet another Christmas and I feel many memories of love and family when it turns on for the first time every season. Are you going for a real tree this year or do you belong to the artificial tree family? For decades I felt mild derision toward the artificial tree enthusiasts; I would never have one of those atrocities (much of the attitude was toward the feakish metalic gold or silver trees, and the ones that deliberately look artificial). Some 10 or more years ago, I realized that my seasonal near-death respiratory episodes had to do with the natural tree sitting in my living room in December. Now the season's tree ritual involves a cardboard box full of twisted wire branches and carefully concealing the melted "pine needles" that spent a season too close to the electric baseboard radiator. Sigh. I too have converted to the artificial tree. Back when my son was around 3 (he's now 21), I bought a real tree. We lived real close to a truck route, so the needles fell off with every truck that passed. By Christmas 10 days after purchase it looked like Charlie Brown's Christmas was in store. I will only ever have a real Christmas tree! It spins? Very cool. I want to see more pictures! As I get older the idea of an artificial tree appeals to me...no needles in the carpet, no watering, no sawing off the trunk to make it fit. I think if I got one though I'd have it be SUPER artificial looking like a pink one or all silver or the incredible black one I saw at Treetopia. The holidays should be enjoyable and if a real tree makes you miserable celebrate it anyway you want...a friend of mine puts lights up on a huge wire frame and calls it a day...she's a minimalist! We've always had artificial trees, but I love when the vendors set up shop in my neighborhood. They're usually the same people every year and I enjoy watching families pick out their trees & wreaths while I'm doing holiday errands. It's great when you see how excited the kids are to get the tree—you know they're already thinking about Christmas morning! That said though, I think I probably will always belong to the artificial tree club since it's just easier. As someone who has never owned a real Christmas tree, I'm a huge proponent of artificial trees. How could you not love a tree that never dies (and spins in circles)? Artificial trees are a common theme in my family, and my grandmother's tree has a remote-controlled train that goes around it playing a variety of Christmas tunes. I keep saying I want to have a real tree one year, but I can never truly convince myself to swap over to the "live" side. Thanks for sharing your tradition, Karen. We grew up decorating live Christmas trees. As an adult however, I have not put up a Christmas tree in my own home. I have been feeling a bit nostalgic recently. I told my partner last night I'd like to put up a tree next year and host a holiday party for the neighbors. It will be a live (balled&burlped) tree we can plant in the yard after the holiday. We brought our Tree on Sunday although finding the perfect one took some time ( My husband and I have different Tree tastes) it looks beautiful and I am loving the seasonal aroma. I hate the fact that millions of tree's are killed each year just to hang ornaments inside one's house. In addition to tradition, there are many other benefits to selecting a real Christmas tree. Real trees are a recyclable resource, and for every real tree harvested, one to three seedlings are planted the following spring. Also, real trees are planted by farmers, and grown on U.S. farms. Thus, selecting a real tree supports the local economy on an annual basis, helping to preserve local farms and the corresponding green space. I've always said I would never, ever have an artifiical tree, but th is year in our contemporary house I tried to convince Fred that I wanted a silver one . . . or maybe hot pink. But have been vetoed! I think they are very retro. I think if I decided to do fake tree, I would want to go all-out with pizazz! Much to my man's shagrin, I would buy a silver tree. I think it would be so much fun. Who knows, maybe when my living situation expands beyond a 350 sq ft studio in NYC, I'll have MORE THAN ONE tree (a real and a fake). Everybody loves Christmas trees big or small! Glad for the option for the allergy sufferer. Everybody should have a Christmas tree. In central VA, where some Christmas tree farms are, an artificial tree is sacrilegious. I love to see miles of Christmas trees growing. It is so cool. I have decorated a cactus, if that's all I've got. I love real Christmas trees because they're the best choice for the environment. Everyone seems to think artificial ones are better because they use them for years, but real trees turn into mulch, compost, or wildlife habitat when you toss them; artificial trees sit in the landfill and can't be recycled. Plus, most artificial trees are shipped from places such as China so there's a huge carbon footprint; real trees reduce your carbon footprint as they grow! And they're grown on tree farms, no different than lettuce or other crops. For every tree harvested, there are more planted to ensure the tree farms can stay in business. I have two older brothers and one of my fond memories of my youth was our annual argument over which Christmas tree we would come home with from the local YMCA. Looking back, none of us really cared, we just enjoyed the good old fashioned family "discussion" each year!